To Be or not to Be is a question that has been asked many times before. 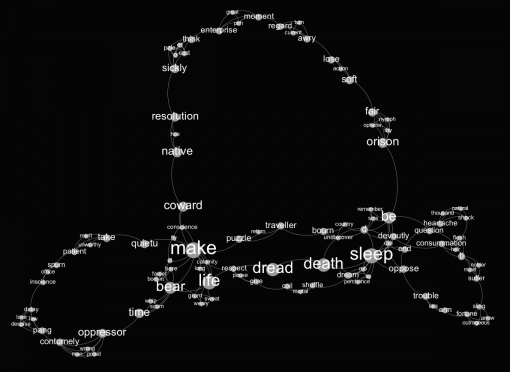 We were curious what happens if we visualize this passage of Shakespeare’s classics as a text network (using the polysingularity method) and then read the text through the network. What are the other possibilities contained within the passage? Sickly pale thinks the enterprise of the moment. Be sleep death dread and life to bear. Unworthy merit takes the quiet. We leave it up to you to judge our efforts in re-reading Shakespeare’s poetry – it would be actually interesting to hear what you think about it and whether you find it somewhat related to the original text. A brief visual analysis of the resulting network image for the text above shows that structurally it’s not too far away from the original passage. The most central concepts are similar and structurally they are connected to the similar clusters of meaning circulation. However, some concepts within these clusters. 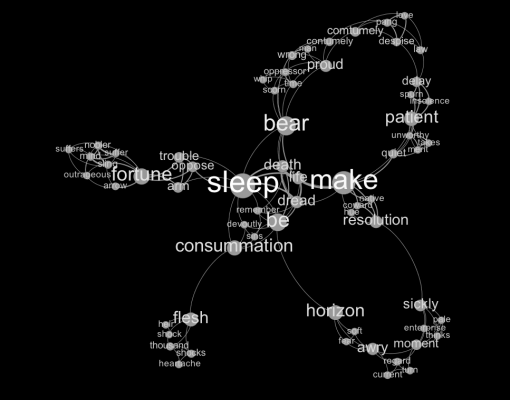 are much more emphasized than in the original text: especially the ones on the periphery, such as “orizon”, “sickly”, “fortune”, “flesh”, and “patient”. Brief data analysis also shows that the quantitive parameters of the resulting graph are similar, the only difference is that we used a smaller vocabulary during the reading and that resulted in shorter diameter and average path length (as less words are needed to connect one morpheme to another). However, the average degree and modularity are somewhat similar and both graph have very similar degree distribution charts and overall graph structure. We will be reporting more results from this work later. 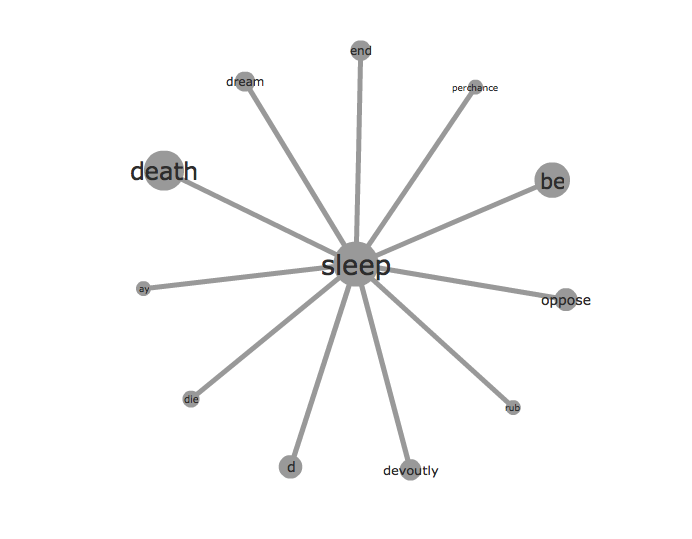 In the meanwhile, the original raw data for you to play around are available in GEXF format here (right-click to save, then open with Gephi or GexfWalker).